Increase handling and cornering grip in any driving situation with the high quality Eibach Sway Bar Kit for Volkswagen MKVI Golf/GTI! The Eibach anti-roll sway bars mate up perfect with any Eibach spring sets to allow critical fine-tuning of your car's handling characteristics. Every sway bar are manufactured from cold-formed, high-strength aircraft-grade steel, and finished with a long-lasting red powder coat finish. It comes complete with greased urethane bushings for improved responsiveness and all mounting hardware and instructions are included for an easy installation. Take your VW Golf/GTI handling to the next level today with Eibach Sway Bars from ModBargains! 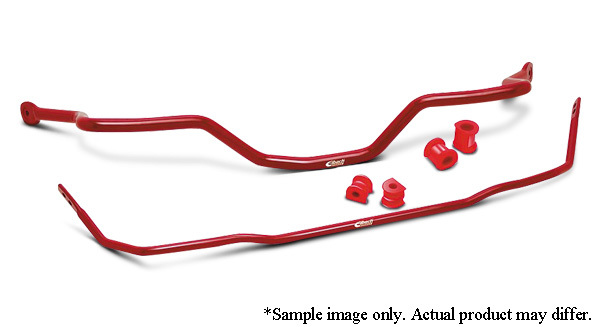 *Front Sway Bar Is Solid And 2 Way-adjustable/ Rear Sway Bar Is Solid And 2 Way-adjustable.